Wowwee, this post is actually old and moldy and was sitting in my drafts for years. I don't know why I never published it. 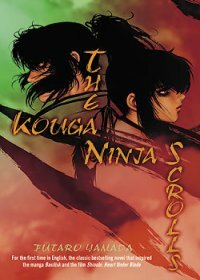 I love the action and intrigue that can be found in Chinese wuxia literature like "The Book and the Sword" and Japanese ninja stories like this one. I really wish more of it would find it's way over here. I can't even think of similar story off the top of my head, but there's gotta be a whole bunch of 'em. If you know of any with official English translations, send 'em my way. 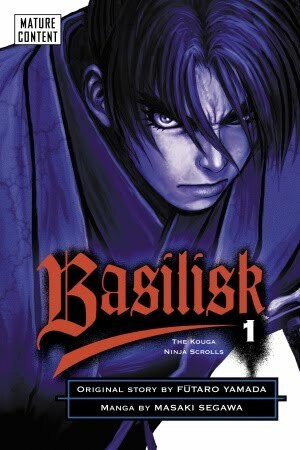 The manga "Basilisk"... which is great. 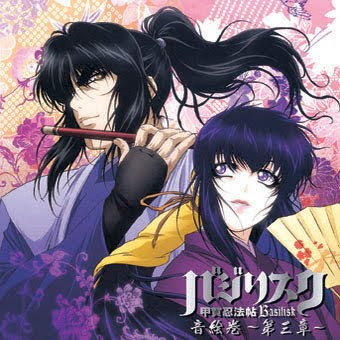 The anime "Basilisk"... which is effin' awesome. The live-action movie "Shinobi: Heart of Blade..." which I could live without since they changed too much for my liking. But anyway... The Kouga and Iga clans have been at odds for generations and were bound by a no-hostilities pact into a forced peace. Circumstances dissolve this and force ten from each clan into combat: the side with the most survivors determines the next shogun. And the top it off, all twenty of these ninjas are pretty much freaks of some kind. One guy has super stretchy limbs while another man is like some kind of human spider. It's like going to the circus and watching the clowns kill each other. (As they should.) Admist this, Gennosuke of the Kouga and Oboro of the Iga, the future leaders of their respective clans, were in love and to be married. Any hope for their love is undermined by their own allies thirst for battle. I love, love, love this story so I admit started in this biased. I had devoured the Basilisk anime and manga and didn't really realize they were based on a story published over forty years previously. The book version is very simple to read. Not an insult. I like an easy read where the author doesn't yank out their thesaurus and try to use every word inside. I don't know if this is a function of Yamada's own writing, the Japanese language, or the English translation but it works. While not a ninja story, I think fans of this story will also love the wuxia story "The Book and the Sword" from Chinese author Jin Yong.